PARMA, Ohio — It's a story 30 years in the making. Shortly before graduating from Parma Senior High School, Jim Biehl customized, purchased and started wearing his class ring. It was your typical class ring with green emerald gem, a cross etched below the stone and Biehl's signature on the inside. But Biehl would only spend about one year with that ring. When he was 17 years old he went on a church trip to Michigan. During the journey the group stopped in Parma, Michigan, and ironically that's when he would lose that brand new class ring. "I woke up one morning to move on to the next destination of our trip, the next leg, and couldn't find it," Biehl said. "Haden't seen hide nor hair of it since then." The then teenager spent a couple of years searching for the lost piece of jewelry only to come up short each and every time. Biehl thought the ring was gone forever, until recently. Biehl said he was alerted to a Facebook post inside the Parma Senior High School Alumni Association. The post read, "Found class ring 1989. Jim Biehl call...." with a phone number and an email address. 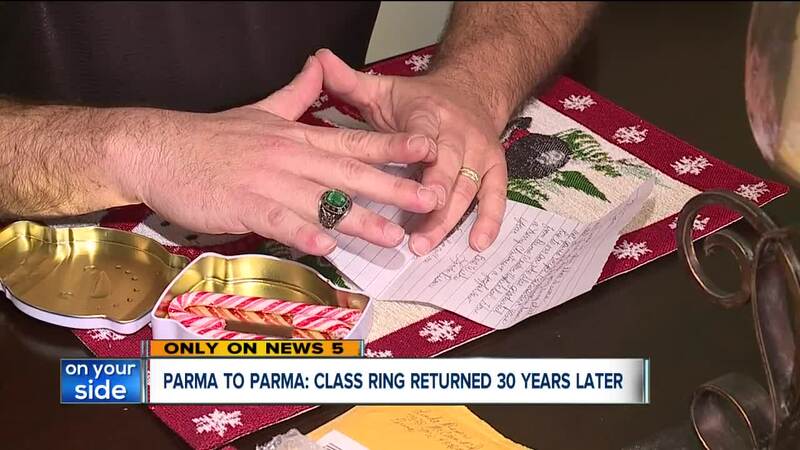 As it turns out, a woman named Linda Risner, who lives in Parma, Michigan, found Biehl's ring three decades ago when he first lost it. "She indicated she had the ring for quite some time and has been trying to reunite it with its owner and every time she tried she ran into a road block," Biehl said. Risner held on to the ring, searching for Biehl off and on for 30 years. Finally, she found the alumni association page and eventually that led her to Biehl. Biehl said he called Risner and described what he remembered, and just days later the ring was back in Ohio with its rightful owner. "I was just flabbergasted that somebody would go through that amount of effort, that amount of work over a stupid little ring," he said. The ring doesn't fit quite as well as it once did, but Biehl said this "stupid little ring" has taken on a whole new meaning. "In her note to me she said her husband had given his high school ring to their son and kind of passed it on. It got me thinking, it's not a stupid little piece of jewlery. It's something I can pass on to my kids when my time is long and done," he said. Biehl said the ring serves as a reminder of his roots, where he came from and how much his life has changed since high school. It also reminds him of the good people in the world. "The only thing I can say is, 'thank you' and it doesn't even seem to scratch the surface being able to show proper amount of gratitude." 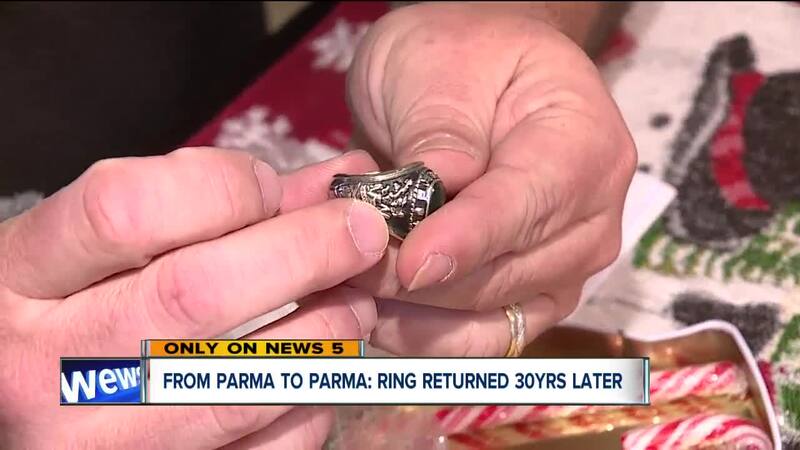 The 1989 Parma Senior High grad said he plans to have the ring re-sized so he can wear it from time to time.